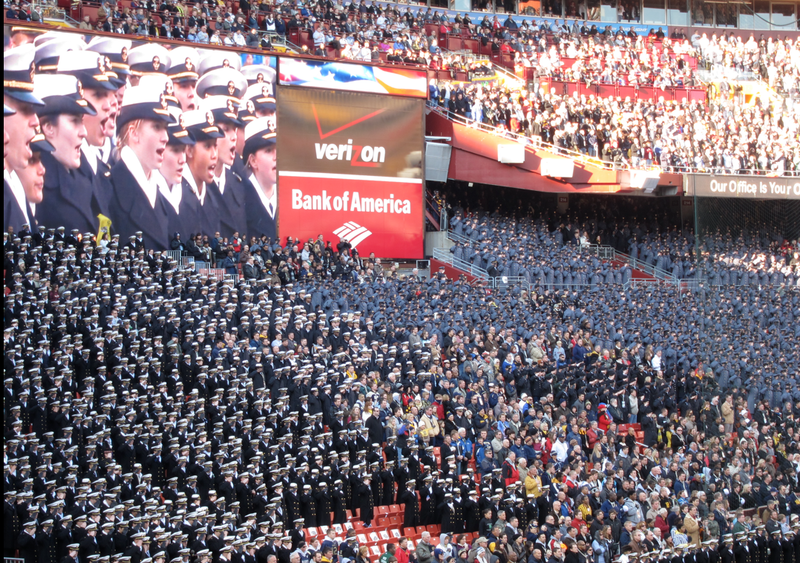 Army-Navy Game, A Decade of Dominance for Navy ~ Learn, Live, and Explore! 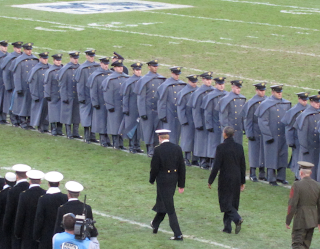 For the 112th time in U.S. college football history, the Westpoint Black Knights and the U.S. 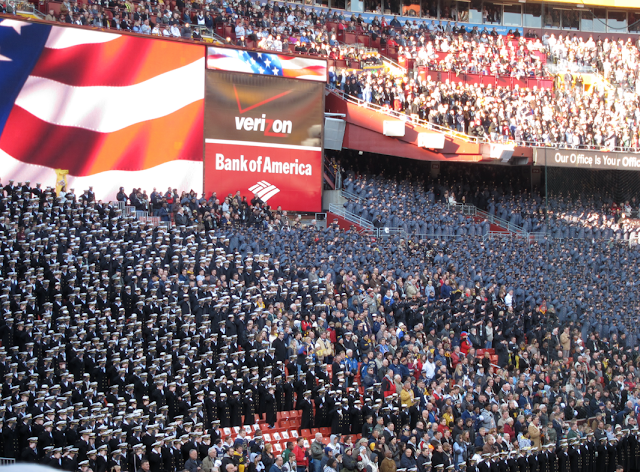 Naval Academy Midshipmen met on the football field for the annual Army-Navy game tradition today, December 10th, 2011. Not only is this an annual tradition for the two military colleges, but it's also an annual television watching event for my dad, a former Navy officer himself! So, when I heard that they were going to be playing the game at FexEx Field in D.C. this year, I got on the phone and told him he should come out. True, the best seat for the game is always the one at home, especially with a DVR, but there's just something special, that I love, about experiencing things in person, if only just once. Aside from the chilly temperatures, an unrelenting wind, and pocket hand warmers that didn't want to work, the game was fantastic. There were all the traditions, starting with the Brigade of Midshipmen and Corps of Cadets marching into the stadium (that we, unfortunately, missed because we didn't want to arrive that early in this frigid weather). 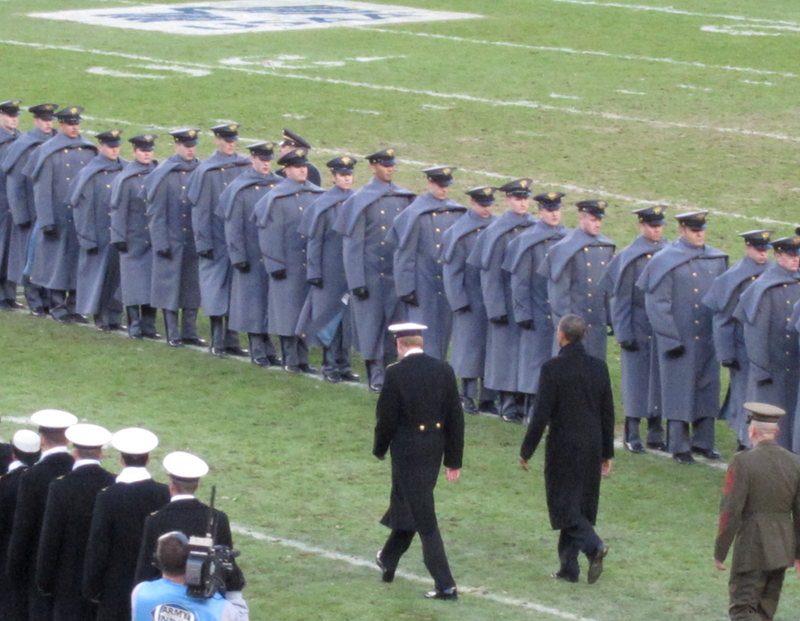 Then, for the coin toss, our 44th President of the United States, Barack Obama, plus VP Joe Biden and other high-ranking officials in the President's Cabinet and in the U.S. Military arrived on the field to handle the toss. 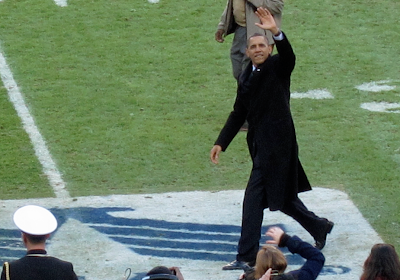 After 10 years living in D.C., this was the first time I've seen a U.S. President in person, and it was something I'll always remember. 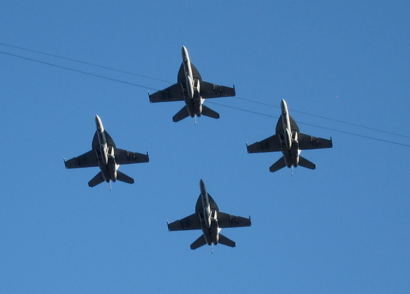 Of course I celebrated this monumental event by ordering a flyover of the stadium by four Navy fighter jets and four Army helicopters - no, just kidding, they were part of the traditional opening ceremonies as well. I also want to mention how much I enjoyed the various traditional fight songs and cheers from both sides. Although I'd have to say that the award for the most spirited section definitely went to the men and women in gray. Maybe it's an underdog thing. As for the football, the first half was exciting, with several turnovers due to fumbles and a tied score at halftime: 14-14. In fact, it wasn't until the middle of the fourth quarter that the Midshipmen began to feel a small sense of relief, as their team started to play a little smarter and pulled ahead for good. The final score was Navy, 27- Army, 21 - the closest game in a decade and the record 10th win in a row for Navy! The President's halftime symbolic walk across the field to show his support for both teams, watching one half of the game from each side. The Prisoner Exchange - Selected juniors at both schools spend the first semester of their school year attending their rival institution, ending with a "prisoner exchange" during the football game to symbolize their return to their respective schools. Navy's Bill the Goat and the Army Mule - I went to a high school with no real mascot and had a Wildcat at college, so clearly I had never seen a live mascot before! Cute! The Go Army! and Go Navy! spirit spot videos on the big screen created by servicemen around the world to mock their rivals and show their spirit. I think Navy got the award this year for the funniest spot - a parody of a charity infomercial, set to the classic Sarah McLachlan tune "Angel," pleading for the adoption of disheartened, crying Army cadets after 9 (now 10) straight losses. Final Respects - in a show of solidarity and mutual respect, after hours of being rivals on the field, at the conclusion of the game both teams walk to the losing academy section, line up and sing that school's alma mater. Then the turn around and go to the other side of the field to sing the alma mater for the winning institution's students. It was an honor to be a part of this annual Army-Navy game, and to witness these two military institutions at their finest. 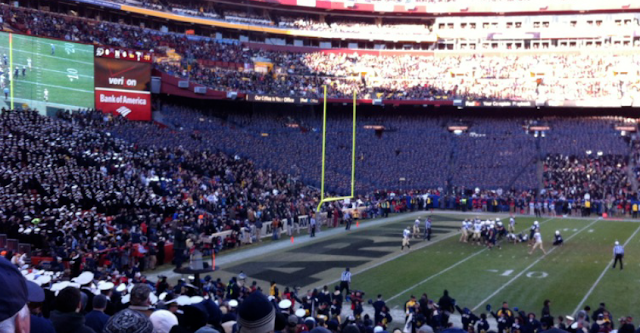 While I also appreciate the more common collegiate football experience, especially having attended a large school with a relatively good football team, there's something different about these young men and women at West Point and USNA, standing tall and sharp in their uniforms, that makes you proud to be a part of the game that day, regardless of which team you're supporting. Go Navy! Beat Army! ..... Go Army! Beat Navy!